Late Departure One-Day Tour of Niagara Falls - equinoxbus.com - Charter Bus & Sightseeing Tour Operator serving the Greater Toronto Area, Hamilton, Ottawa, Niagara Falls, London, Stratford, Kitchener-Waterloo, Guelph, Brantford, Burlington, Oakville, Cobourg, Belleville, Napanee and Buffalo, NY! Experience our most requested afternoon/evening tour which includes a 20 minute Voyage to the Falls Sunset Cruise, Cave of the Winds on the US side, Miniature Train ride available Tuesdays to Sundays and Buffet Lunch! Departure Dates and Tour Packages Pricing will be available by the end of April! 3 convenient pick ups: Scarborough - Town Centre Court, Downtown/Union Station - On York Street and Front Street West and Mississauga at McDonald's - 1050 Dundas Street East. Start the day with friends from Toronto to Niagara Falls! 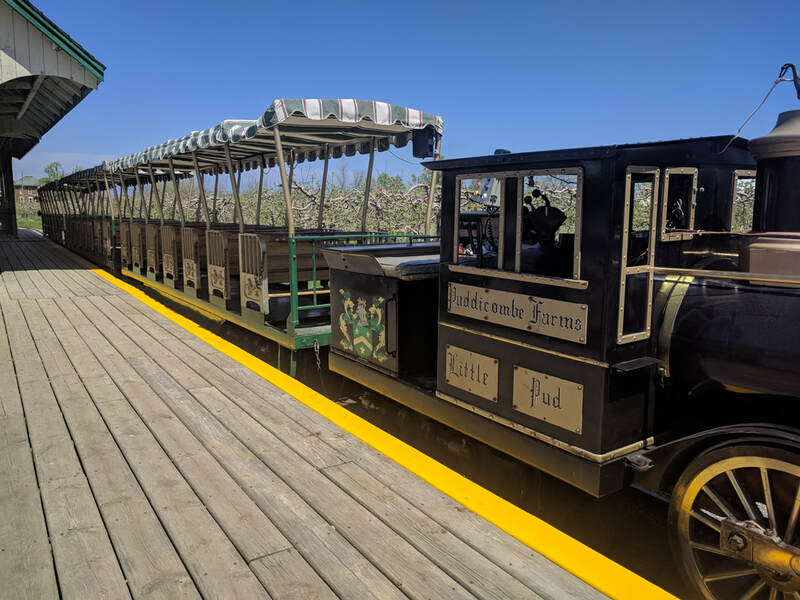 We first stop halfway in Hamilton at Puddicombe Estate Farms and Winery to take in a lovely Miniature Train Ride up to the Niagara Escarpment! We then proceed for Lunch at a Continental Buffet with lots of options! 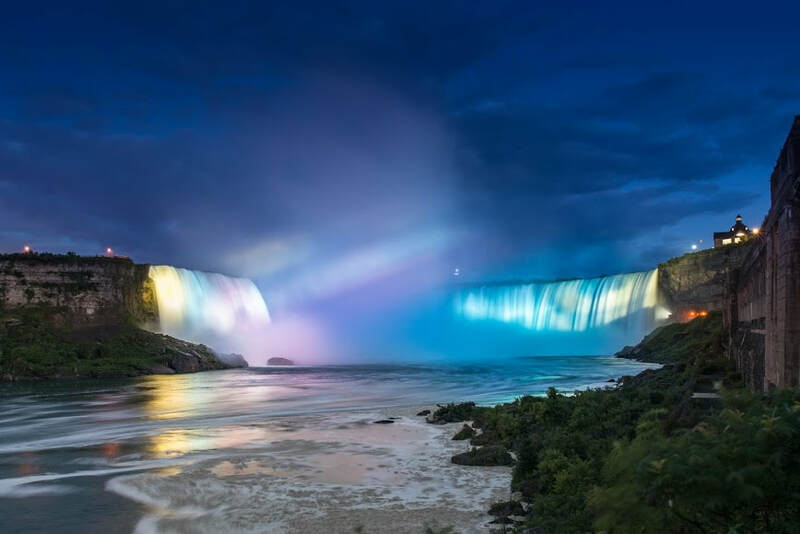 We then make our way to Niagara Falls at Table Rock Visitor's Centre where you can view the Canadian Horseshoe Falls! 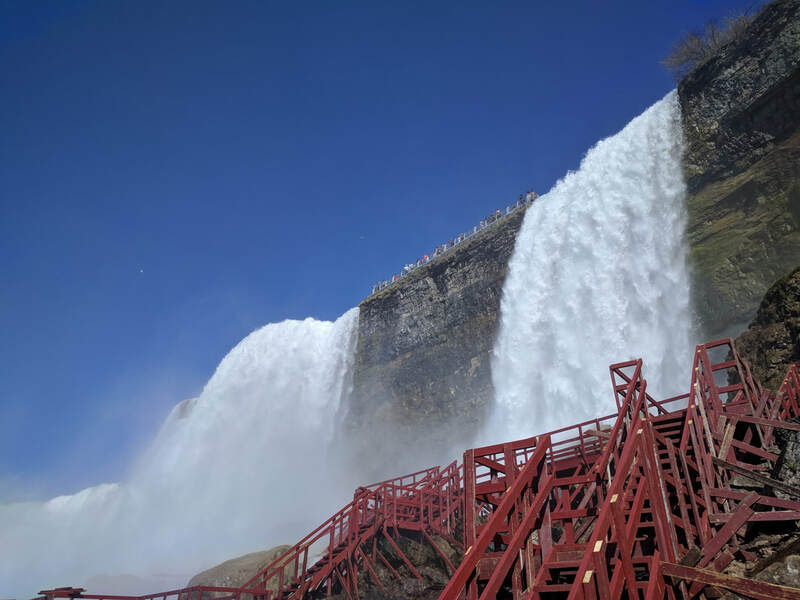 We then make our way over to the United States of America to get up close and personal with the Bridal Veil and the American Falls at Cave of the Winds! 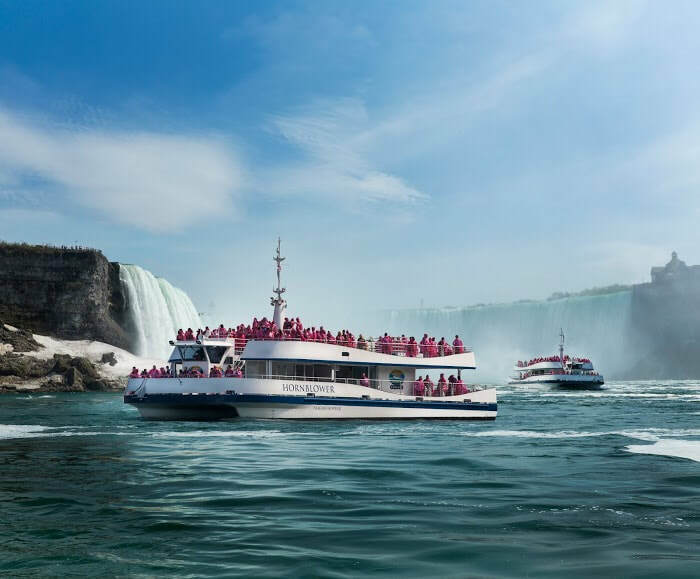 We then proceed back to Canada and visit the Historic Town of Niagara-on-the-Lake and then we go back to the Falls to take in a 20 minute Voyage to the Falls Sunset Cruise! After enjoying the Fireworks display we then head back to Toronto! Departure Dates and Tour Packages Pricing will be available by the end of April! Photos of Hornblower cruise with Fireworks and Hornblower Niagara Cruises Logo are courtesy of Hornblower Canada Co. and are used with permission by Hornblower Canada Co. Images used are copy written and belong to Hornblower Canada Co.
Fireworks can be cancelled at any time due to inclement weather such as high winds or rain. There will be no refunds of any kind should inclement weather happen during the Cruise or any other parts of the Tour. Should you choose not to part take of the attractions, or you show up to the attractions late, you are considered a no show and both vendors will not refund our reservation fees and therefore we will not issue any refunds of any kind.